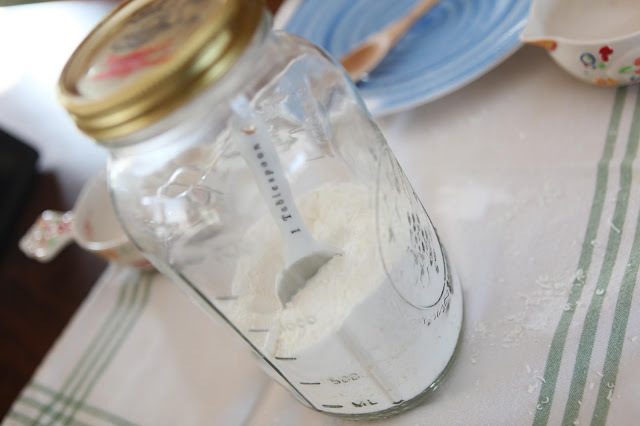 Using Soulemama's recipe as a guide, I finally tried making my own laundry powder. Why, oh why, did I wait so long?! It was incredibly easy to do, works remarkably well, saves a ton of money, makes us more self-sufficient, and (saving the best for last here), actually makes laundry day exciting! The recipe is basically 2 parts castile soap to 1 part everything else (borax, washing soda, and baking soda). Based on my research, I'm not sure the baking soda is really necessary, but we have hard well water here, so I left it in. Plus, I think it might help deodorize the clothes. And, really, what isn't baking soda good for? I used Dr. Bronner's peppermint bar soap as suggested in the recipe, and it smells just perfect for the holiday washing I'm doing. That was the most expensive part of making this at home, so in the future I will likely try making my own bar soap too. I finely grated enough soap for 1 Cup, and put the remaining nub by the sink to use as hand soap. 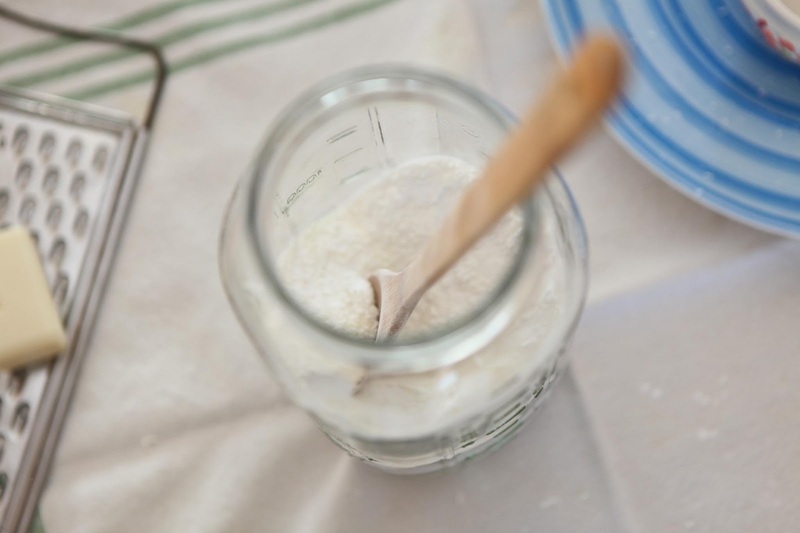 I added everything to a wide mouth mason jar, stirred it up with a wooden spoon, and put the lid on to store it. 1 Tablespoon per full load of laundry is working very well, even on the cloth diapers. I have one of those fancy water-saver, high-efficiency, front-loading machines, and to be honest, I wasn't sure it was getting things all that clean. But, truly, this soap made all the difference, and I now think it was the store-bought natural citrus based laundry liquid I previously used that just wasn't up to snuff. Drying the laundry in the sun on the outside line helps with stains and freshening up, too. I love opening up the jar and smelling the freshness of the powder. It just makes washing a more cheerful, beautiful chore for me. It's simple, but it makes all the difference. 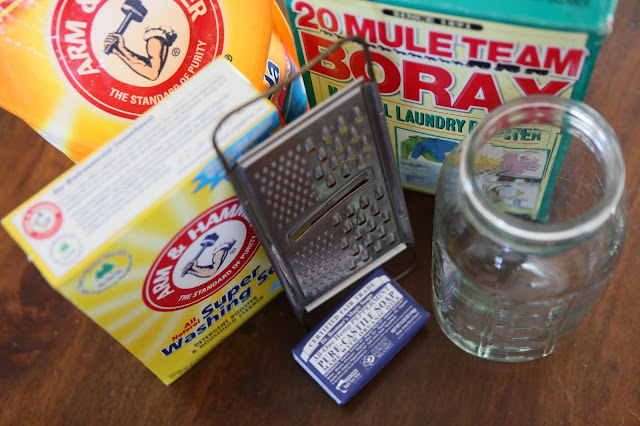 Do you make your own laundry soap, too? **Edited to add: Check out my updated formula HERE. What a super idea. I've got a front-loader as well and am supposed to use HE detergent. Would this work for me, do you think? Do you use any fabric softener? Our clothes get so staticky (is that a word) this time of year! Hi Tonya, Yes absolutely! It doesn't create many suds at all, so it's actually perfect for HE machines. I'm still figuring out the static thing too...White vinegar as a fabric softener (added as the clothes are in the wash) is supposed to work well, but I haven't had luck with that--might have something to do with our well water. Usually my towels still end up a bit stiff from the outdoor line. Hopefully others will have some ideas to share also! I too have yet to make my own laundry soap... it's been on my list for oh, a year now. yikes. maybe this is the inspiration... and the fact that the store bought is gone. We too struggle with static... but I found that if I hang dry the culprits (fleecy pajama pants, fleece vests, etc) the rest of the load seems to come out fine. 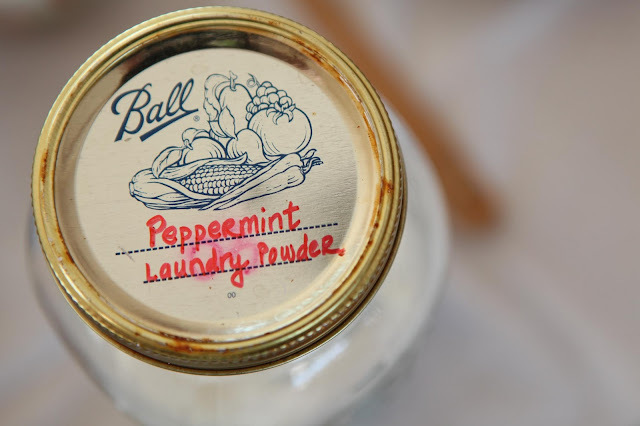 I make my own liquid soap - but I like the idea of peppermint! I think I may give the powder type next time around. Thank you for passing on the recipe! 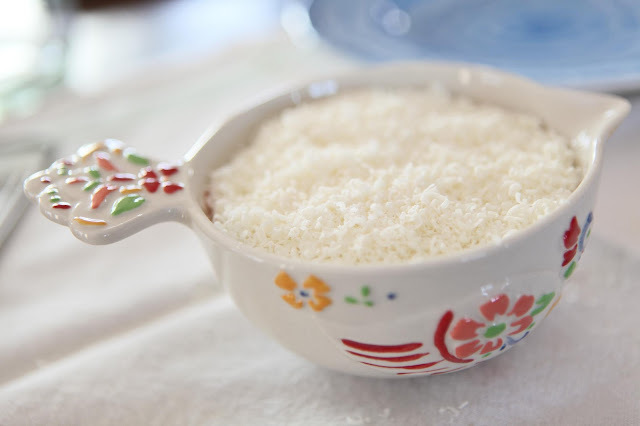 I use white vinegar in the rinse cycle to help reduce static cling. As far as stiff towels, sometimes 'snapping' them as you take them off the line softens them up a bit. Thanks for the review and nudge as this is something I've been meaning to experiment with too. Stiff towels are about the only thing I dislike about not having a dryer, but, its not that big of a deal so whatever! Okay, i'm going to have to try this recipe. The last time I tried to make laundry soap it was liquid and it didn't work so well. Where did you buy Dr. Bronner's peppermint bar soap? I tried making my own laundry soap and wasn't very happy with the results. I think my hubby just gets too, too dirty! Tirza, I bought it at Vitamin Cottage, and have seen it in other health food type stores also. I think Target may even have it, although I haven't been there in a loooong time! Candy, thank you for your kind words and support! I know what you mean, too! There are many wonderful blogs out there. It's great to see and be a part of. Visiting your blog from SouleMama. I use vinegar in my white laundry because it makes our uniform shirts not as stinky. My sister in law uses in on my brothers flight suits because it helps get rid of the smell of jet fuel. I figure if it works on jet fuel it should work on BO as well. What lovely photos Jaime! I have been making liquid laundry wash for quite a while now and love the fresh smell. I use vinegar in the final rinse. I think a high proportion of washing soda can soften the water and hence your towels, maybe worth a try! Good to know that it's economical and works on front loading machines. I will have to see where I can get the ingredients. I have not seen washing soda here before. I have yet to try this, but you inspire me to add this to my list To Do list in the new year! Thanks! I use a similar recipe and love it! @Mama Gone Green I, too, am seriously in love with this laundry soap. Even my recently-visiting relatives were impressed with how little it took to clean a big load of their clothes! I did this too! I love it.